Gottipaty N Rao (2007). Physics Laboratory Manual Part I-Mechanics Computer based interactive laboratory experience. Deer Park, NY: Linus Publications. 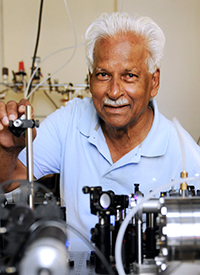 G. N. Rao (2004). COLOR AND THE WORLD. London, United Kingdom: Elsevier/Academic Press. G. N. Rao (ed) (1987). Laser Spectroscopy. Basel, Switzerland: J. C. Baltzer Scientific Publishing Co, Also published in Hyperfine Interactions Journal, 38 (1987). G. N. Rao (ed) (1987). Quantum Optics, Lasers and Laser Applications. Basel, Switzerland: J.C. Baltzer Scientific Publishing Co. Also published in Hyperfine Interactions Journal, 37 (1987)..
G. N. Rao (ed) (1985). Hyperfine Interactions in Solids. Basel, Switzerland: J.C. Baltzer, also published in Hyperfine Inetractions Journal 25(1985). Gottipaty N Rao and Andreas Karpf (2011), Extremely sensitive detection of NO2 employing off-axis integrated cavity output spectroscopy coupled with multiple-line integrated absorption spectroscopy. Applied Optics, Vol. 50 Issue 13, pp.1915-1924. Gottipaty Rao, James Garofalo and Elias Lanides (2011), Diffuse reflectance-factor measurements of rose petals. Color Research and Application, 36, 148-154. G. N. Rao and A. Karpf (2011), External cavity tunable quantum cascade lasers and their applications to trace gas monitoring. Applied Optics,, Vol. 50 Issue 4, pp.A100-A115. (2011), 110-115. G. N. Rao and A. Karpf (2010), High sensitivity detection of NO2 employing cavity ringdown spectroscopy and an external cavity continuously tunable quantum cascade laser. Applied Optics, 49, 4906-4914. A. Karpf and G. N. Rao (2010), Enhancement of trace gas detection by integrating wavelength modulated spectra across multiple lines. Applied Optics, 49, 1406-1413. A. Karpf and G. N. Rao (2009), Enhanced Sensitivity for the detection of trace gases using multiple line integrated absorption spectroscopy. Applied Optics, 48, 5061-5066. G. N. Rao, C. Gudipaty and D. Martin (2009), Higher harmonic detection employing wavelegth modulation spectroscopy and near infrared diode lasers: An undergraduate experiment. American Journal of Physics, 77. A. Karpf and G. N. Rao (2009), Absorption and wavelength modulation spectrocsopy of NO2 using a tunable external cavity CW quantum cascade laser. Applied Optics, 48, pp. 408-413,. Gottipaty N Rao; A. Karpf (2010). A Trace Gas Sensor at ppb Sensitivity Based on Multiple Line Integration Spectroscopy. In Conference on Lasers and Electro-Optics (CLEO) 2010 paper: JWA60. (pp. 2). San Hose, CA. Gottipaty N Rao; A. Karpf (2010). Sensors at ppb Sensitivity or Better Based on Multiple Line Integration Spectroscopy Techniques. In Laser Applications to Chemical, Security and Environmental Analysis (LACSEA) (pp. 2). San Diego. 1. Atomic Hyperfine Strusture Studies using temperature/current tuning of diode lasers: An undergrdautae experiment, American Journal of Physics, 66 (1998) 702-12. 2. Computer Based Tunable Diode Laser Spectrscopy for High Resolution Spectroscopy, Hyperfine Ineractions, 1 (1996) 529.